Author(s): Tairong Kuang, Dajiong Fu, Lingqian Chang, Zhaogang Yang, Zhou Chen, Liliang Jin, Feng Chen, South China University of Technology, 381 Wushan Road, Tianhe District, Guangzhou, Guangdong 510640, China. Xiangfang Peng. Due to core-shell nanostructures, highly branched and star-shaped macromolecules with three dimensional structural symmetry, dendrimers have been widely used as non-viral vectors in gene delivery. However, the performance of dendrimer-based gene vectors is far from ideal, mainly because of the low transfection efficiency and serious cytotoxicity. Therefore, many researchers focused on how to improve the transfection efficiency and reduce the cytotoxicity in the past decade. In this review, we mainly reported the most recent advances of dendrimer-based gene delivery systems. 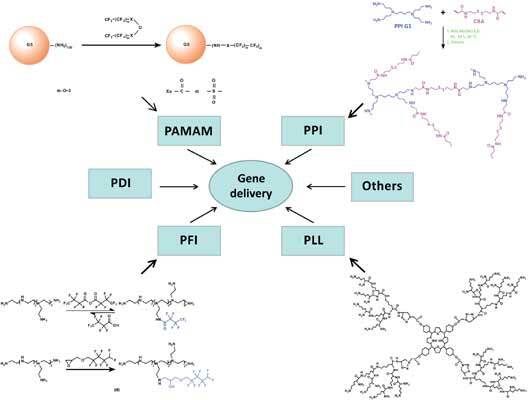 Several typical types of dendrimers for gene delivery were reviewed in detail, such as poly (amido amine) (PAMAM), poly (propylene imine) (PPI), poly(ether imine), poly-Llysine dendrimers. Recent advances about other types of dendrimer were also briefly mentioned. These advances provide a promising route to improve the transfection efficiency and reduce the toxicity, which also illustrates the direction of the future development of dendrimers in gene delivery. Keywords: Dendrimers, non-viral vectors, gene delivery, transfection efficiency, cytotoxicity. Affiliation:South China University of Technology, 381 Wushan Road, Tianhe District, Guangzhou, Guangdong 510640, China. Keywords:Dendrimers, non-viral vectors, gene delivery, transfection efficiency, cytotoxicity. Abstract:Due to core-shell nanostructures, highly branched and star-shaped macromolecules with three dimensional structural symmetry, dendrimers have been widely used as non-viral vectors in gene delivery. However, the performance of dendrimer-based gene vectors is far from ideal, mainly because of the low transfection efficiency and serious cytotoxicity. Therefore, many researchers focused on how to improve the transfection efficiency and reduce the cytotoxicity in the past decade. In this review, we mainly reported the most recent advances of dendrimer-based gene delivery systems. Several typical types of dendrimers for gene delivery were reviewed in detail, such as poly (amido amine) (PAMAM), poly (propylene imine) (PPI), poly(ether imine), poly-Llysine dendrimers. Recent advances about other types of dendrimer were also briefly mentioned. These advances provide a promising route to improve the transfection efficiency and reduce the toxicity, which also illustrates the direction of the future development of dendrimers in gene delivery.